B2B players looking to simplify and streamline marketing processes and marketing-related tasks may find what they need in Marketo. Founded in 2006, it is a leading marketing automation platform that boasts of 100,000 users and 2,300 customers from all over the world. Marketo is simple, user-friendly, sophisticated, and flexible. It is a comprehensive platform that empowers users to do a multitude of tasks and achieve impressive results. Aside from marketing automation, Marketo can also be integral in areas like marketing management and customer engagement. Marketo is also customizable, allowing for real-time personalization so users can have a system that fits their preferences and requirements. Multiple benefits await Marketo users. First of which is its user-friendliness. It has a visual drag-and-drop interface that lets users create professional email templates, even if they do not have any previous HTML experience. Users can also simplify email marketing, as users can pre-define a series of steps, actions, or timing that sends out an email. Social components are also built into emails sent via Marketo, mainly through the “Forward to Friend” functionality. Users can also try out different kinds of content and immediately change the content to fit specific situations via email testing. Marketo’s drag-and-drop interface and pre-designed templates make it easy to create landing pages. Potential clients can also be aggressively profiled with data capture forms, which in turn yield lead data over time. 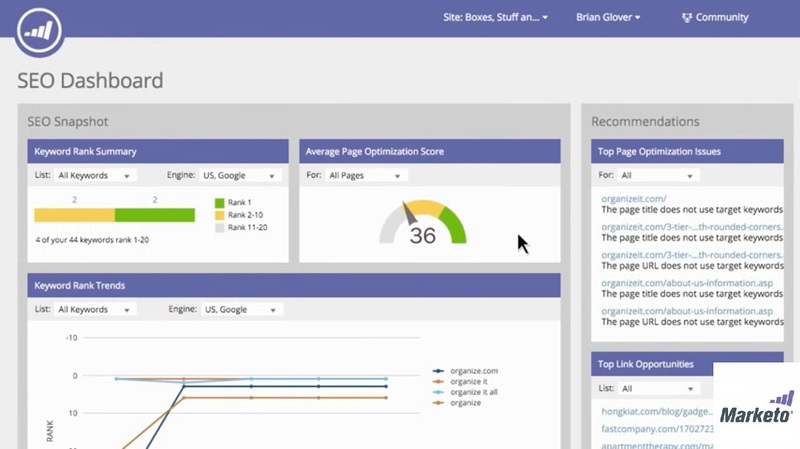 Marketo can also convert landing pages into Facebook pages. Its dynamic content capabilities allow users to tweak and customize them. Collaboration and awareness between marketing teams and sales teams are also enhanced by Marketo’s capacity to integrate with Salesforce, Microsoft Dynamics, and other leading CRM platforms. Marketo users can also set parameters and criteria such as prospect behavior, sales reports, demographics, and product scores to gather strong leads, making Marketo a great tool for lead management. Marketo is also a powerful social marketing platform that can be applied in the areas of social promotion, social sharing, and social engagement. Its reporting and analytics features deliver all the figures a business may need and produce reports based on different metrics like campaign performance, lead performance, and email and landing page performance.